Complete light set including 3 x NEO 2 LED lamps supplemented with all kinds of essential accessories making it ready for many video & photography assignments. Hit the ground running with this NEO 2 LED 3-Light Kit from Rotolight, which bundles three versatile and feature-rich NEO 2 LED lights with a variety of essential accessories to help you quickly create a three-point lighting plan. 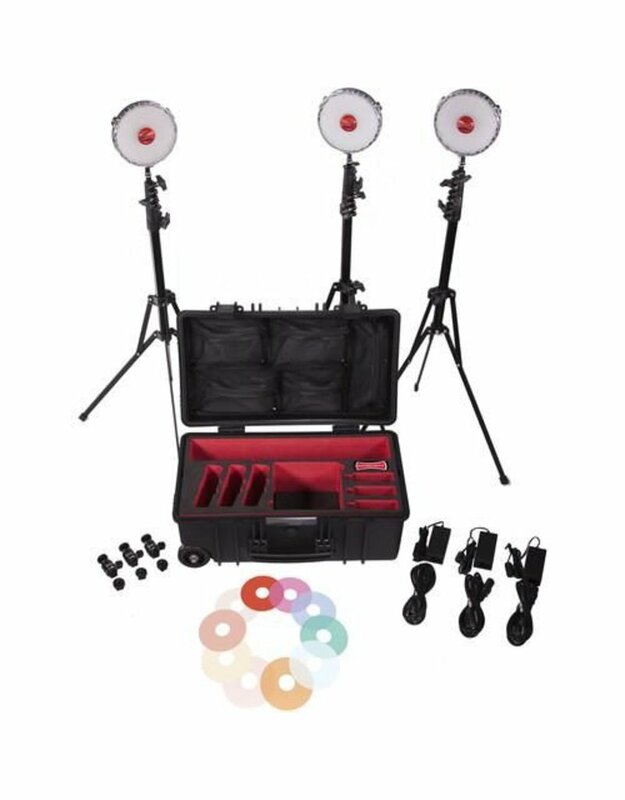 This kit includes an add-on color FX filter pack with 10 colored gels to help you create unique looks with each light. 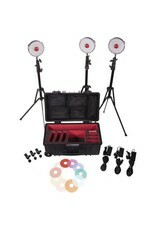 It also comes with three ball heads and compact light stands so you can get them set up and oriented with ease. 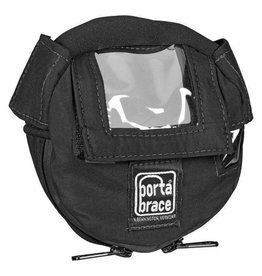 Additionally, the kit features a dedicated hard case to hold all the various pieces of the kit and make it easy to transport and store. 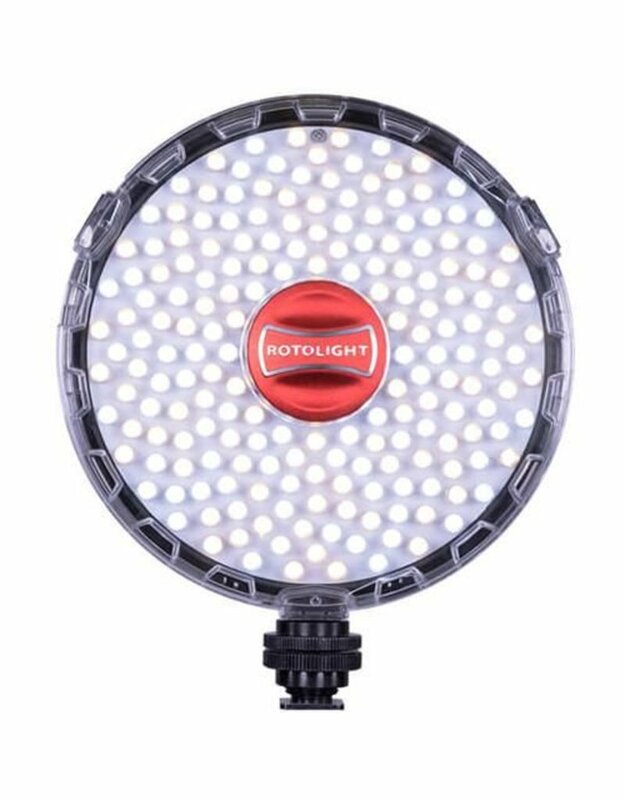 Able to function as either a continuous light or a flash, the round NEO 2 LED Light from Rotolight breaks new ground with functions designed to satisfy the demands of both video shooters and still photographers. 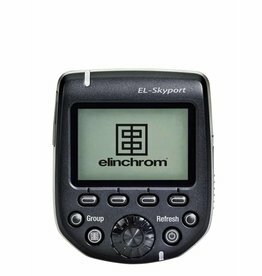 The most significant feature in this fixture is the inclusion of a built-in, 2.4 GHz Elinchrom Skyport Receiver, enabling support for high-speed sync and remote triggering of the unit from up to 656' away when using an optional Skyport Transmitter. Also, it features Accu-Colour Technology to ensure optimal color rendering, proven by the rated CRI of 96 and TLCI of 91. Output has been significantly improved as well, with an increase of 85% over its predecessor, and a flash mode that can boost output by 500% for stills and will help freeze action. At max power, this results in an output of 2000 lux at 3' for continuous lighting, and a setting of f/8 at ISO 200 for flash. Beyond pure output improvements, the fixture offers a variety of functions to help users get the most out of the light. Primarily it does this through a variable color temperature of 3150- 6300K, meaning it can be quickly and easily balanced to the ambient light whether it is tungsten or natural daylight. Other features include True Aperture Dimming to help more easily calculate your exposure information, and a CineSFX mode to automatically program certain looks for use in a scene, including the mimicking of police or fire light effects. 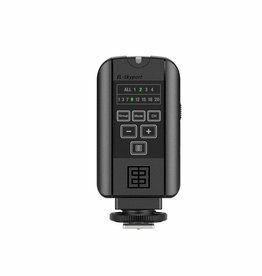 - Both continuous and flash modes are available so users can quickly switch between video and stills shooting without needing to change out the lights. 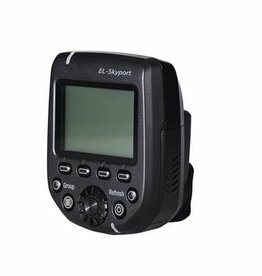 - The built-in 2.4 GHz Elinchrom Skyport Receiver makes it possible to use the NEO 2 as a remote flash with high-speed sync support up to 1/8000 second. 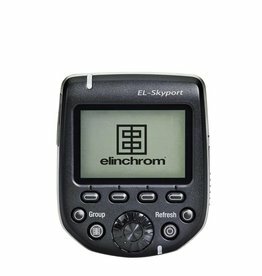 This requires the use of an optional Elinchrom Skyport Transmitter, and allows for remote control over the NEO 2 from up to 656' away. Users can also sync using a wired PC sync or 3.5mm connection. - Accu-Colour Technology ensures high-quality color rendering with a rated CRI of 96, with an R15 of 99 and a rated TLCI of 91. It also helps ensure maximum accuracy throughout the adjustable color temperature range of 3150–6300K. The LEDs used are also flicker-free and have a lifespan of about 100,000 hours. - Overall output is rated at about 85% greater than its predecessor. - The flash mode provides about 500% more light output when connected to a mains power source, or 250% when running on AA batteries. -Local dimming and controls are made possible through a rear display and two dials/buttons on the rear of the fixture. - True Aperture Dimming uses shutter speed and ISO information, as well as distance data, to calculate the proper aperture for your shot. 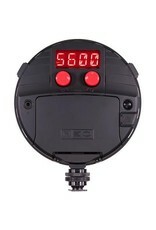 It improves speed and use, and helps shooters quickly get the appropriate power settings for their subject. - Designer Fade mode allows users to program fade-up and fade-down effects, including the ability to set the duration. - Cinematographic Special FX, or CineSFX, features a variety of different settings and mode to create ambiance in your scene. This includes options for strobe, lightning, throb, color cycle, fire, police, television, and more. - No recycle time or power loss is evident when using the NEO 2, making it a suitable option for high frame rates. - For power, users have the options of six AA NiMH or Li-ion batteries, DC power over the D-Tap connection, or AC power from the included adapter. 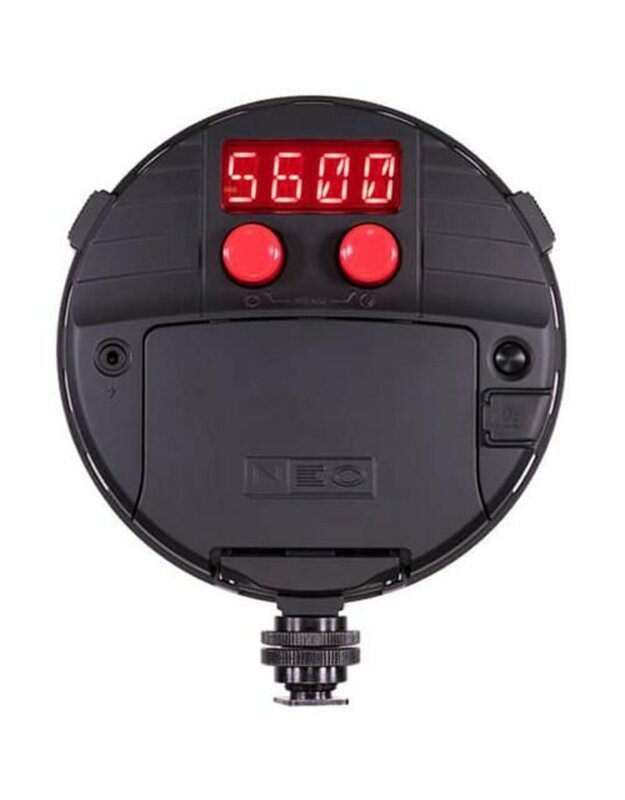 When running on batteries, the NEO 2 can run for 85,000 full-power flashes, or 1.5 hours of continuous lighting. - The NEO 2 can be mounted easily using the three 1/4"-20 tripod threads located around the edge of the light. A shoe mount adapter is included as well for using the NEO 2 as an on-camera light. 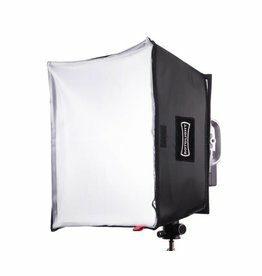 - A filter kit is included which features a 216 Full Diffuser, 250 Medium Diffuser, 184 Cosmetic Peach, and a 279 1/8 Magenta for creating unique or more flattering light for your subject. 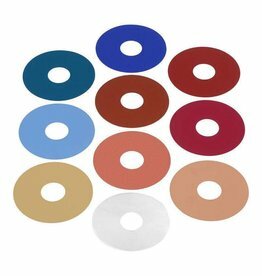 The 10-piece Add-On Color FX Filter Pack for NEO from Rotolight is designed to enhance your lighting by adding creative color to your Rotolight NEO LED light. The filters are particularly well suited when using the fixture as an accent or fill light and can be used in conjunction the NEO's CineSFX mode to create customizable visual lighting effects. - The Rotolight 360° Pro Ball Swivel To 1/4-20 Adapter adds a swivel mount to your tripod lighting stand, or camera. The adapter can support up to 4.4 lb (2.0 kg) and works with a standard 1/4-20 tripod connection. 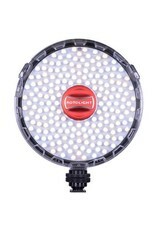 - Photographers and video crews shooting with NEO, RL48 and other fixtures weighing up to three-pounds, will appreciate this Compact Light Stand from Rotolight. A five-section stand, it extends a full 84". Folded size is only 19.3" for easier storage and transportation. A versatile stand, it includes a reversible stud for 1/4 - 3/8" fixtures. 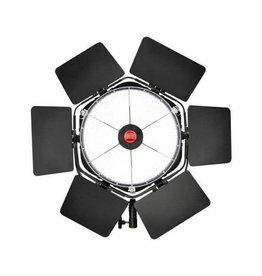 - The Rotolight Hard Waterproof Wheeled Kit Case for NEO LED Light is an airline shipping-quality protective case with wheels and an air release valve. It fits up to three NEOs, each with its compact light stand, barndoor set, power supply, and accessory pocket.